This is my mother’s recipe for the spicy and extremely tasty Kottayam style fish curry. This fish curry can be left outside for 1-2 days and tastes better the next day. My fish curries were always a flop until I tried this recipe. Those of you who have never had success with a fish curry will find this recipe really useful. Do try it out sometime and tell me how you liked it. It goes very well with rice/ kappa puzhukku/ idli/ dosa. 1. Make a paste of the chilly powder, coriander powder, fenugreek powder and turmeric powder in little water(around 1.5 – 2 tbsp) and keep aside. 3. After adding the fish pieces swirl the clay pot to mix everything well. Bring to a boil and cover with a lid. Cook at medium-low flame. Remember to rotate the meen chatti or pan every 6-8 mts. It generally takes less than 20 mts to cook the fish. 4. Cook until the fish gets done and the gravy is medium-thick. Taste-check the gravy, if it tastes very sour, remove one or two kudam puli pieces. Switcch off. Add some curry leaves and 2 tsp of coconut oil for an extra taste and aroma. If there is a lot of gravy, cook for a few more minutes at medium flame without covering it. Serve with hot rice, kappa puzhukku or even idli/dosa. This tastes best after one day. 1) You can also add shallots along with ginger and garlic but remember to fry them until golden, In order to increase its shelf life. 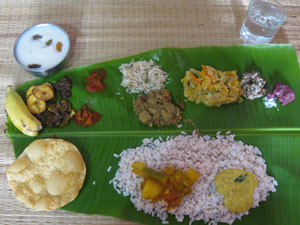 2) You could also arrange the fish pieces on lots of curry leaves in a meen chatti and make the gravy in a separate pan. Once the gravy is prepared pour it over the fish pieces and cook. 3) If you prefer a thick gravy, you can add around 1 – 1.5 tbsp coriander powder for this curry. But in order to increase its shelf life, avoid adding it. Wow….colorful n spicy. My family’s fav one..loved your neat presentation dear. Wooow!!! curry looks soo colourful dear makes me hungry to try it today but yesterday only finished fish had my fish fry. Superb fish curry paa. Regarding ur query on fruit cake,sure dear you can use butter. Omg, Wat a colourful curry, truly tempting and very catchy…yummyy!! I am expecting wonderful pictures as usual and you didn’t cheat me 🙂 Beautiful and tasty recipe. Loved the colour and consistency of the dish. OMG!! this looks soooooooooooooooo good, I haven’t had my breakfast yet.. Im super hungry after lookin this post! Relly mouth watering. Looks so gud..and love your blog…wonderful place..
i like this curry because it so simple and taste superb. kottayam’s own fish curry..
nice color and looks so delicious. Wow superb fish curry…looks so spicy and so tempting :)..lovely presentation. Wow.. colourful fish curry… Looks to be spicy and yummy too.. I love this curry..
Super Fish Curry..Colorful and must have been spicy..
Entamme, echiri chorum koode tharamo..We love this spicy meen curry..Yummies..You Rock!!! love love love this tempting fish curry. would love to try this. what is kudam puli? is it kokum? Fish in red sauce looks divine! this one is wonderful.. let me try this next time. wow… nalla meen curry!!! Love to have it with naadan kappa…. mouth watering indeed!!! Thats a perfect and lovely fish curry..
Oh my! I really miss what my mom makes. She make the best fish curry. Nice clicks too.Red and spicy s=fish curry. i love to have with rice and moru curry. Hi I have tried this kottayam fish curry. It was really tasty….. Thank you for availing the preparation…..expecting more different fish recipes from you guys……….. I have tried this curry from my friend….i like this curry, even though its quite spicy….she served us with kappa which was a match made in heaven…. Did you put mustard seeds? Yes, we’ve used mustard seeds.. Lovely!!!!!! Just came to ur site today but i already decided to try many of ur items…Wish me luck!! Welcome to our space Salu 🙂 Hope you will enjoy our recipes. Do let us know if you try them out..Good luck!! Made this and turned out really well. Thanks for the great recipe. Love your site. Thanks a lot for your feedback. Great to know that it came out well..
Orangesnlemons2003, The best kottayam fish curry ever! Always turns out to be lip smacking !! This was absolutely delicious. My whole family enjoyed the dish immensely.